Now known as Ophiocordyceps Sinensis, after studies in 2007 showed it was largely unrelated to other coryceps. 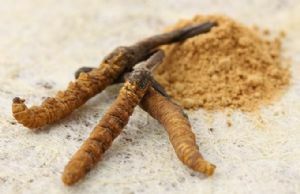 Ophiocordyceps Sinensis also known as the caterpillar fungus, has a long history in traditional Chinese and Tibetan medicines. The polysaccharide components and cordycepin are currently trending in elite sports science and modern medicine. It is not possible to produce the fruiting body of Ophiocordyceps Sinensisis commercially and so this product is the mushroom’s mycelia grown on grain. Manufacturers of this product claim that this produces a more consistent product. Wild harvested Ophiocordyceps Sinensis is highly prized and generates prices in tens of thousands of pounds per kilo. Access to this fungus natural habit is now heavily regulated and has played a role in starting wars.